Guided Boring Method (GBM) or Pilot Tube Method is a three-stage process of installing small diameter (4 to 24 inch outside diameter) product pipe with the precision needed for gravity sewer and water lines. Maximum length of a GBM drive is impacted by many factors, such as pipe size and soil conditions but generally bores can be up to 350 feet long. The jacking shaft may be as small as eight (8) by eight (8) feet square or nine (9) feet in diameter. 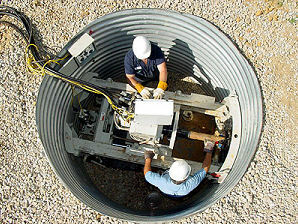 The first stage of the process is the pilot tube installation. It employs a rotating slanted-faced head for steering and a specially designed theodolite guidance system. Accuracy is achieved through video surveillance of an illuminated target at the head. Pilot tubes are installed sequentially behind the steering head. After the steering head has reached the reception shaft, a reaming head and auger tube sections are installed behind the pilot tubes. With the addition of each section of auger & tube in the launch shaft, a section of pilot tube is removed in the reception shaft. The process is repeated until all pilot sections have been removed. The third stage is the product pipe installation. 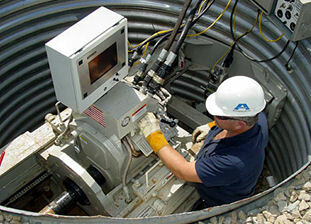 A pipe adapter is installed on the last section of auger casing and subsequent product pipes thrust into place while the auger tubes are removed from the reception shaft.